This is the ninth installment in the “Role of the Poet-Critic” series, which includes interviews with Dana Gioia, William Logan, Adam Kirsch, Stephen Burt, Christian Wiman, Timothy Steele, William Jay Smith, and Rachel Hadas. Interviewer’s Note: Joan Houlihan is the author of four books of poetry: The Us (2009), The Mending Worm (2006), Hand-Held Executions: Poems and Essays (2003), and Ay, forthcoming in 2013 from Tupelo Press. Her poems have been anthologized in The Iowa Anthology of New American Poetries (University of Iowa Press) and The Book of Irish-American Poetry–Eighteenth Century to Present (University of Notre Dame Press) and her work has appeared in many journals and magazines, including Boston Review, Poetry, Gulf Coast, Harvard Review, Poetry International and Gettysburg Review. She is a contributing editor for the Contemporary Poetry Review and author of a series of critical essays on contemporary American poetry archived online at bostoncomment.com. She has taught at Columbia University and Emerson College and she currently teaches at Clark University and Lesley University’s Low-Residency MFA Program in Cambridge, Massachusetts. Houlihan founded and directs the Colrain Poetry Manuscript Conference and the Concord Poetry Center in Concord, Massachusetts. Garrick Davis: When did you begin writing criticism? Did you see it as an inevitable task—an obligation—of your poetry? Joan Houlihan: Provoked by the contents of the Best American Poetry of 1999, I began writing a series of critical essays on contemporary poetry called The Boston Comment, with the first essay focused on trying to understand what aesthetic principle(s) guided the selection of these poems when so many read as prose (“On the Prosing of American Poetry”). In fact, the work in those pages was not close to anything I would call “best” and so I began the process of trying to sort out how contemporary American poetry in general was being evaluated. I did not (and do not) think of myself as a “critic”— to my mind, that term belongs to the likes of Abrams, Pritchard, Winters, Jarrell, etc. (the critics I studied as a grad student) and, more recently, to scholars like Harold Bloom, Helen Vendler, Stephen Burt and Adam Kirsch. I am not a scholar. I thought then, and think now, I am a poet first (I was writing poetry for about 15 years before I wrote about poetry), a critic (or commenter, or reviewer) second. Obligation? Yes, I certainly felt a sense of obligation to the field I had chosen (or had chosen me, as it sometimes seemed), and which I felt passionately about, to attempt to understand why so many poems seemed to be dull or lacking, and why my perception was singularly at odds with a popular anthology that purported to showcase the best in American poetry. I was curious to know how the poems achieved this standing (a sampling, I thought, of contemporary American poetry at large) because it was certainly not obvious to me and perhaps (I thought) not obvious to other interested readers. I believed my perception “singularly” at odds because at that time I found no one else writing about the disconnect between the purported purpose of this anthology (“best”) and the actual contents. In fact, the more I searched for dissenting voices and the longer I came up with none, my sense of obligation deepened. In some way, I felt that I was dishonoring my own poetry and dedication to the art itself by not speaking up against this display of packaged taste that was, well, mostly tasteless. It also seemed that there was a need for, let’s say, some consciousness raising. So, to honor my choice of this difficult and consuming vocation called poetry, I felt a need to state my position regarding poems that were not, even though lauded by critics or written by famous poets, worthy of the name “poetry.” I was a bit high-minded that way. It seemed to diminish what I was doing to have all that “imposter poetry” floating around unchallenged. JH: I’m disappointed by the present situation of most poetry criticism, from book-length studies to single reviews. For example, when I delved into so-called avant-garde poetry (which I re-titled “post avant-garde” or “post-avant” for short, or, post-post avant, to indicate—jokingly—to the general reader that this was even more avant-garde than “post avant-garde”), I searched for some clear-headed criticism from contemporary poets and critics that would enlighten me as to its genesis and, most importantly, would guide me toward an appreciation of it. At that point, I still believed there was a “there, there” and I was missing it. I quickly discovered that the prose written about both language poetry (its predecessor) and my jokingly-coined post-avant poetry was itself opaque. This disturbed me. Combined with falling into the rabbit hole of post-avant poetry and its criticism, was the vehement and sometimes shockingly angry reaction I was getting to my essays from poets responding on blogs and through email. My inquiries were obviously stirring up dust, but what was the cause? I had hoped for a clear defense/apologia or simply an idea of how to read such poems as the ones I cited in my essay on post-avant-ism (“Post-post Dementia”), but instead I got vitriol (even threats) or an urgent gratitude (from people who did not want me to “use their names”). What was going on here? A nerve, as they say, had been hit. Some poetry critics (and poet-critics) I read and admire and, most importantly, can understand well enough to agree or disagree with are: Adam Kirsch, Ernest Hilbert, Jan Schreiber, Stephen Burt, Helen Vendler, David Orr, Tony Hoagland, Glyn Maxwell, David Yezzi, and lately, Rusty Morrison. I enjoy reading William Logan and more recently, Michael Robbins, as much for their wonderfully clear-eyed and fearless opinions as for their wit. I leave it to VIDA, by the way, to discover why there is a general dearth of female reviewers and critics, but I hope we don’t settle for anything that is merely gender-based just to increase the numbers. I’ve never been democratic that way: i.e. there’s a lot of negligible criticism by men so let’s have an equal amount of negligible criticism by women. JH: The present situation of poetry is thriving but only in the way that weeds thrive. People often complain that I am too narrow, that I should “let a thousand flowers bloom,” that time will decide which ones remain. Well, yes, time will do that. But we’ll be dead then. Also, to drag out the analogy, a thousand flowers are blooming right alongside ten thousand weeds. In the meantime, what are we supposed to read without feeling bored or disgusted? There’s the problem of sheer numbers (and the ongoing wonder at why there are so many people going into poetry. Do we really need more poets? ), and there’s also the problem of, shall we say, variable quality (some choose to call this “eclecticism” or “wide-ranging aesthetic practice” which is different). These two problems—quantity and quality— are related, and the critic’s main task is two-fold: to evaluate and to educate. I do not often see reviews or essays with that two-fold task at the center. I think the present situation of poetry (both its too-muchness and its wildly ranging quality) is directly related to the present situation of criticism—there’s not enough vigorous weeding. Ideally, the weeding should be done by the educated reader, the customer who buys and reads the books, and not the critics per se, but readers are not being educated very well about poetry through poetry criticism or reviews or even, I have to add, by poetry teachers (who themselves often dispense with the evaluative task in re: contemporary poetry). And so we have the present situation of a thousand flowers being strangled by ten thousand weeds. GD: Do you see your own criticism as that of a poet’s, partial and dogmatic, or an ideal reader’s? Is there a vital connection between your own poetry and prose? JH: I see my own criticism as that of an ideal reader if we think of that reader as someone who: 1. Loves the art of poetry itself, not just individual poems; 2. Is well-read (and not just in poetry); 3. Meets the poem on its own terms, that is, without prejudice as to its form, content, style and unfolding; 4. Enjoys being intellectually and emotionally challenged; 5. Is drawn to mystery but put off by obscurity; 6. Is thrilled by masterful writing of any kind, that is, by the way a line is constructed, how it moves, word choice, syntactical grace; 7. Likes to learn something new (in craft or content); 8. Wants to be at least as engaged in a poem as in a successful magic act. My one question for a poem is simple: is it interesting? If so, I’ll keep reading, and in that reading I’ll make other evaluative judgments; for example, a poem can’t be interesting if it’s confusing (though it can be interesting if it’s mysterious), can’t be interesting if it’s pedantic (but can be if it’s intellectually challenging), can’t be interesting if it’s sentimental (but can be if it evokes emotion), can’t be if it’s merely clever (can be if it’s original), can’t be if it’s predictable (can be if it’s surprising) and so on. So that one question: Is it interesting? carries with it a lot of evaluative possibilities. JH: Though I never attended a creative writing program, I teach in one regularly (low-residency) and a few sporadically (full-residency), so I will comment with the disclaimer that I have limited experience/knowledge of the many programs out there. 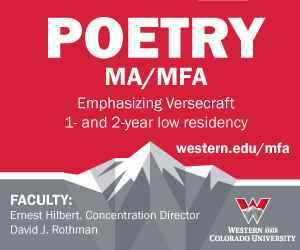 My impression is that such a program is worthwhile because it provides a kind of compressed-in-time and intense exposure to readings, instructions, ideas, community, and mentoring that poets could obtain otherwise but at greater expense of their time. And time is important. Having said that, I really have no idea why people are enrolling in these programs if they’re at all interested in making a living, or if they have even a slight understanding of the kind of commitment the life of a poet (or any genuine writer or artist) entails (one that has no known return on investment), or if they can fairly evaluate their own ability in relation to the great poets (and why do it if you’re not working toward greatness? ), or even in relation to their contemporaries. I don’t think that “academicization” per se has a baleful or beneficial effect on poetry; in fact, I think there’s probably far too little of the academic (i.e. rigor and accountability) in many of these programs, and I’m always surprised to find students who have little to no background in the field of literature. As studio programs focused on craft and designed to encourage more and better writing, however, they are a good idea, and better for some poets than others. The ones who benefit most are those with more than middling talent and more than middling ambition—but they would do what was necessary for their art anyway. I’m really not sure what the rest of them imagine they are doing there. However, they are at least learning how to read and appreciate poetry, and god knows we need more readers. The truly baleful effect on the field is that such programs are increasing the number of people aspiring to be poets. We have a huge surplus of poets and very little demand. Maybe it’s a good idea to pay programs to stop producing poets, like paying farmers to stop producing surplus crops of corn or grain. JH: Approaching this from the reader’s side, it’s helpful to know when browsing for a book of poetry, that a poet/book is an award winner. It provides a kind of brand-name legitimacy to have a gold sticker on the cover of a book, and enables a reader overwhelmed with choices to make a good choice (or at least not a bad one). When we talk about the critic’s role in “educating” a reader, it’s wise to realize that not many critics are being read either (or, as I often find when reading other critics, they are being skimmed then shelved because their academic jargon or concerns with long-dead poets render them useless to any common reader looking for a book of contemporary poetry to read). The main reasons someone chooses to read a poet are: recommendations from friends, assigned by a teacher, already knows the poet’s work and wants to read more, or it receives notice in a major news source (NYT, NYRB, etc.). Blog reviews and social media comments are like recommendations from friends, though these “friends” are usually like-minded poets/poetry readers who form a sort of community around a shared aesthetic. GD: Do you think your criticism has hurt the reception of your poetry? Have your reviews cost you anything? JH: It’s impossible to prove that my criticism has hurt the reception of my poetry, but I assume that it has (or that it will) based on the amount of vitriol it has stirred up over the years. The kinds of emails and blog entries I read when I was doing Boston Comment made it clear that people were highly offended—some emailers even suggested that there would be retribution (I’ll never forget one from a well-known young poet who claimed he would “piss all over anything I tried to do” with my own poetry if I didn’t stop writing “those essays.”) And many who supported me were adamant about not using their names, a good clue to the possibility of retribution. So, logically speaking, I would say that, since in the poetry world someone is always connected to someone (probably only three degrees of separation), and poets are vigilant about slights of any kind, including slights to their friends and/or spouses, there’s bound to be retribution from some quarters. Having said that, I have received (mainly) thoughtful and respectful reviews of all three of my books. That’s encouraging because it shows a willingness to do exactly what the ideal reader and critic should do: take the work on its own terms, apart from how you feel about the author. A difficult standard to meet, but one every reader and critic must strive to meet, including me.